How much do Raiders suites cost? Oakland Raiders suite pricing will vary based on opponent, day of the week, suite location and other factors. Most regular season games will range from $8,000 - $16,000. Pre-season games are much less expensive. An Oakland A’s Club suite is located in the infield. Club suites will include 14-24 tickets and VIP parking passes. Premium in-suite catering options are available to purchase in advance. Suites will feature HDTVs, comfortable seating inside of the suite and a dedicated suite attendant. Loge Suites are located on both the East and West sides of the O.co Coliseum. Loge Suites come with 18 tickets with the option to purchase additional tickets. Premium in-suite catering options are available to purchase in advance. Suites will feature HDTVs, comfortable seating inside of the suite, retractable glass windows, and a dedicated suite attendant. In what may be the Oakland Raiders last season at the Oakland Coliseum, there is a certain wave of excitement surrounding the 2018 Oakland Raiders unmatched around the rest of the NFL. Much of the hype surrounding the franchise is mainly because of one man on the sidelines - head coach Jon Gruden. The Raiders signed Jon Gruden to a historic 10 year, $100 million contract to become the franchise’s next head coach, shattering all other previous contracts signed by head coaches. Gruden has finally left the television booth for the sidelines, where he will look to turn this talented Raiders roster into a Super Bowl contender. In addition to signing Jon Gruden, the Raiders made another splashy acquisition by signing former Green Bay Packers wide receiver Jordy Nelson. Nelson and Amari Cooper form an elite 1-2 punch in the receiving corps for Derek Carr to throw to. Speaking of Derek Carr, he will look to rebound from an up and down 2017 season, hoping to build off of 2016 when he was a potential MVP candidate. With an improved offensive line and more talented receiving corps, expect Derek Carr to take the next step towards becoming an elite quarterback in the NFL. The Raiders also signed former Pro Bowl running back Doug Martin to split time in the backfield with Marshawn Lynch. Beast Mode’s return to the NFL was one of last year’s great stories in the NFL, and it should be once again in 2018. When clicking on all cylinders, this Raiders offense has the potential to be one of the most dominant and exciting units in the NFL. Jon Gruden and the Raiders offense will be can’t-miss entertainment in 2018. Defensively, the Raiders are led by All-Pro outside linebacker/defensive end Khalil Mack. Mack is one of the best pass rushers in the NFL, with over 40 sacks thus far in his 4-year career. Linebacker Bruce Irvin and Pro Bowl safety Reggie Nelson are also key factors in this Oakland defense that will look to take major strides in 2018. It may be the Raiders last season at the Oakland Coliseum, so don’t miss your chance to see the Raiders in a luxury suite before they leave for Las Vegas. The Oakland Raiders home opponents in 2018 are the Los Angeles Chargers, Kansas City Chiefs, Denver Broncos, Pittsburgh Steelers, Cleveland Browns, Los Angeles Rams, Indianapolis Colts, and Seattle Seahawks. Oakland Raiders suite rentals will vary in price based on the opponent and date of the game. 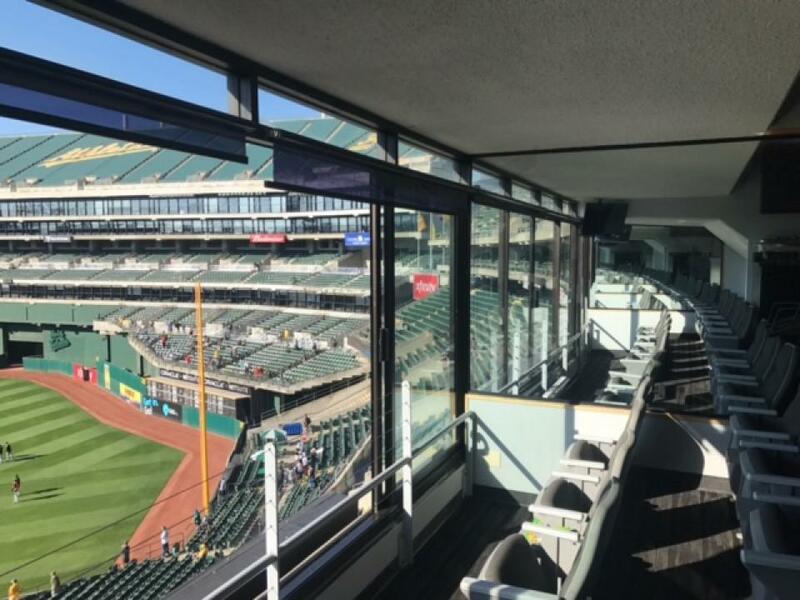 A Raiders luxury box at the Oakland-Alameda Coliseum will include premium in-suite catering options, luxurious furnishings, HDTVs, spacious floorplans and a dedicated in-suite attendant. Along with your Raiders suite, VIP parking and private entry into the Oakland-Alameda Coliseum is included. Most of the 2017 offseason surrounded the announcement of the Oakland Raiders planned move to Las Vegas. The plan is for the Raiders to kick off the 2020 season from their new 65,000-seat dome stadium right near the Las Vegas strip. Before they head to Vegas, the Oakland Raiders will look to continue upon their recent success. It all starts with quarterback Derek Carr who had an amazing year up until he suffered a season-ending injury. Carr finished third in the NFL MVP voting and should receive a long-term extension from the Raiders. Back from retirement, Marshawn Lynch will take over running back duties for the 2017 Raiders. Head coach Jack Del Rio hopes that “Beast Mode” has plenty left in the tank. Another big addition in free agency was the signing of TE Jared Cook. Cook is big pass-catching weapon for Carr. Speaking of pass-catching weapons, Amari Cooper is one of the NFL’s best receivers and Michael Crabtree will enter his second year with the Raiders. On defense, the Raiders feature one of the best players in the NFL in Khalil Mack. Mack was named Defensive Player of the Year in 2016. Mack can do it all with to help him out will be LB Bruce Irvin. In the secondary, the Raiders addressed their need for improvement in the NFL Draft by selecting CB Gareon Conley and S Obi Melifonwu with their first two picks. FS Reggie Nelson went to his second straight Pro Bowl and led the Raiders with five interceptions. With only a couple of years left in Oakland, don’t miss out on seeing the Oakland Raiders 2017 home opponents. At the Oakland Alameda Coliseum, the Raiders this season will play the New York Jets, Baltimore Ravens, Los Angeles Chargers, Kansas City Chiefs on Thursday Night Football, Denver Broncos, New York Giants and the Dallas Cowboys. Suites: Oakland Raiders suite rentals will vary in price based on the opponent and date of the game. A Raiders luxury box at the Oakland Alameda Coliseum will include premium in-suite catering options, luxurious furnishings, HDTVs, spacious floorplans and a dedicated in-suite attendant. Along with your Raiders suite, VIP parking and private entry into the Oakland Alameda Coliseum is included. Offense: After years of futility the Oakland Raiders finally have a real chance to compete for the AFC West Title. That hope starts with All-Pro quarterback Derek Carr. The younger brother of former 1st overall pick David Carr, carries Oakland’s playoff hopes on his shoulders this season after a superb 2015, in which he threw for just a shade under 4,000 yards and 35 touchdowns. Carr should cement his place as one of the best young quarterbacks in the NFL this season with another year developing chemistry with talented wide receiver duo, Amari Cooper and Michael Crabtree. In his first season Cooper accomplished a feat only 5 Raiders had every accomplished before, making the All-Pro team as a rookie. The Alabama product proved that he was worth all of the hype finishing with over 1,000 yards and 6 touchdowns. The sky is the limit for the talented youngster especially under the mentorship of veteran Michael Crabtree. Crabtree knows the expectations that come with being a top draft pick and should help Cooper continue to thrive in his role as #1 wide receiver. Crabtree himself is finally starting to live up to his potential as he had one of the best seasons of his career in 2015 recording 922 yards and a career high of 9 touchdowns. To balance the exceptionally gifted passing game is bruising running back Latavius Murray. Murray had a breakout season in his second year and the powerful back is looking to build on a season in which he finished with over 1,000 yards and 6 touchdowns. Defense: Despite great years from Derek Carr and Amari Cooper, the Raiders team MVP in 2015 was definitely stud linebacker Khalil Mack. The Buffalo product harassed opposing quarterbacks last year finishing with 15 sacks and 12 tackles for loss. The All-Pro is definitely one of the cornerstones of a stout Raiders defense. Malcolm Smith is likely another player the Raiders view as a foundational piece moving forward. The middle linebacker had a dominant 2015, leading the Raiders in tackles and figures to do tons of damage to opposing offenses patrolling the middle of the field this upcoming year. In the offseason the Raiders addressed their biggest weakness in 2015, the secondary, by signing safety Reggie Nelson and drafting Karl Joseph. Reggie Nelson should fill in admirably for retired Hall of Famer Darren Woodson after leading the league in interceptions last season. Joseph profiles as a dynamic playmaker in the secondary and draws comparisons to both Brian Dawkins and Early Thomas. A Raider’s defense that was already one of the better defenses in the league should improve to be a top two or three unit after plugging in quality players at its weakest positions. Schedule: In 2016, the Oakland Raiders will host the Atlanta Falcons, San Diego Chargers, Kansas City Chiefs, Denver Broncos, Houston Texans, Carolina Panthers, Buffalo Bills and Indianapolis Colts. Suites: Oakland Raiders boxes come with exclusive VIP entry into O.co Coliseum, private access to clubs and parking. Guests can order in-suite catering from a diverse and delicious menu. Suites will feature luxurious furnishings, HDTVs, spacious floorplans and a dedicated in-suite attendant. O.Co Coliseum skyboxes provide the ultimate viewing experience for Raiders Football. Thank you for signing up for specials at Oakland-Alameda County Coliseum. Enter your email address below to stay in touch. 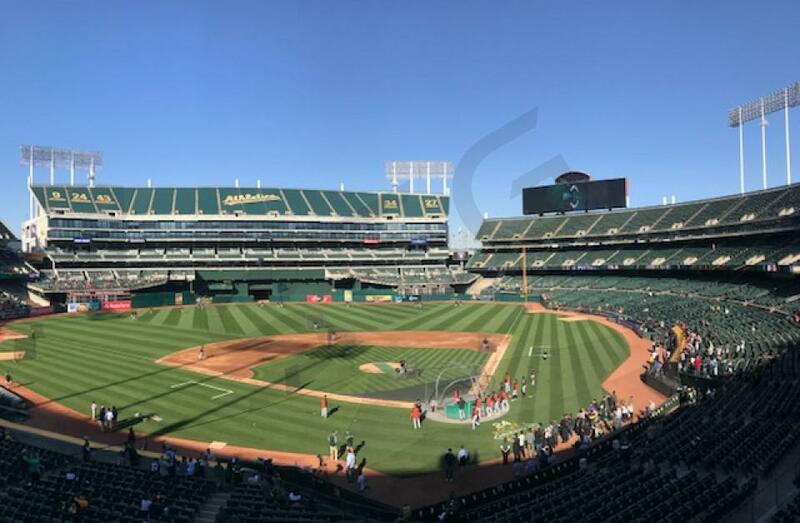 We'll sign you up for our newsletter, which will inform you of the latest inventory and events at Oakland-Alameda County Coliseum. We promise we will never sell or distribute your information. The seating chart below shows where the Oakland Raiders suites at Oakland-Alameda County Coliseum are located.